In each backpack, there are 7 cats. For every cat, there are 7 kittens. How many legs are there in the bus? PS: Paws are considered legs, and a cat has 4 paws. PPS: This is a real math problem, not a trick question. ANSWER: 10,990 (or 10,992 if you're assuming there's a bus driver). EXPLANATION: Let's start with the girl legs. There are 7 girls × 2 = 14 girl legs. Now let's count the cat legs. 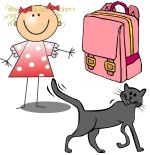 There are 49 backpacks which means there are 343 cats × 4 = 1,372 cat legs. Finally, let's count the kitten legs. There are 343 cats which means there are 2,401 kittens × 4 = 9,604 kitten legs. The total number of legs is 14 + 1,372 + 9,604 = 10,990 (or 10,992 if you're assuming there's a bus driver).